The television show Dallas was on in the hospital room while I was laboring with my second child, and my husband and the doc were engrossed in it while I pushed, shoved, and said lots of bad things. 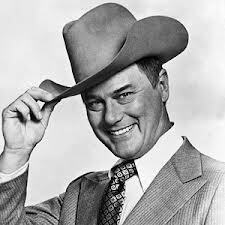 My daughter was born on a Friday night, and, except for this night when I was a little distracted, Dallas was my Friday night ritual for the astonishing 13 years (1978-1991) it was on TV. And who was the pivotal character in this soap of soaps, and the first on prime time? J.R. Ewing, aka Larry Hagman. Dallas was a Baby Boomer creation, and for those fabulous 13 years, Larry was an iconic symbol of Baby Boomer life, good and bad. Now Larry is gone, and for some reason, his passing has struck me intensely. It is the end of an era – the end of a hard-drinking, chain-smoking, wild partying time where we did all bad things to our bodies but had a hell of a time in the process. ‹ A Robin in the Road on Thanksgiving Day!